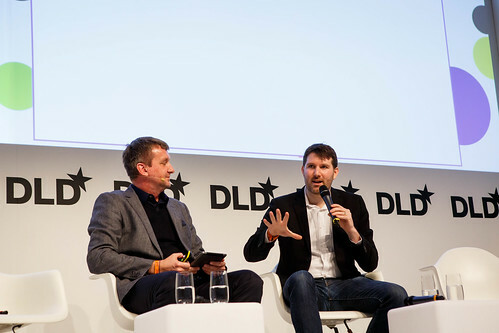 Lunch is over and DLD14 continues in the Maxsaal with a conversation between Eli Pariser and Jochen Wegner. Wegner is the editor-in-chief of ZEIT-ONLINE, one of Germany's highest quality news sites. Eli Pariser is an author, online organizer, and the co-founder of UpWorthy, a media startup focused on making content that matters go viral. According to Fast Company, UpWorthy has grown more quickly than any other media startup. His book, "The Filter Bubble: What the Internet is Hiding from You", is a New York Times bestseller. In this Pariser described how the net is developing, arguing that the more individualized information gets, the more users receive filtered information – just a slice of what is out there. 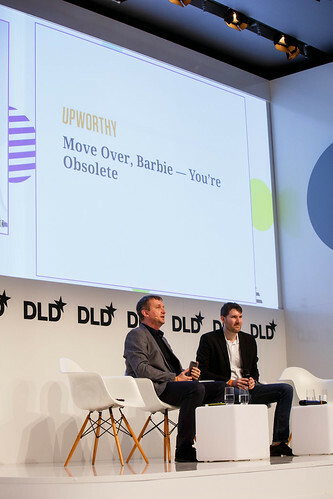 "UpWorthy is for those people who haven’t totally given up on the world – that’s our niche," says Pariser. Before beginning the US startup approximately two years ago, Pariser had noticed what he refers to as passion driven media. Stories that were shared by people because they wanted a specific topic or cause to lift off. "When we started we wanted to curate those pieces of media that stirred people’s excitement", Pariser says. Overhead are examples of UpWorthy's headlines, such as "This amazing kid died. What he left behind is wondtacular." Typically, these headlines are two highly emotive short sentences. Roughly 260 items are published per month. "I was hopeful that there were a few million people in our niche. Turns out, there were a lot more," says Pariser modestly of UpWorthy’s 80-90 million users, of which seven million are core subscribers. Wegner observes that Pariser “wrote this book about the filter, and then you created your own feel-good filter bubble.” Laughing, Pariser agrees. When he wrote the book he was bothered by the fact that important topics were often lost in the barrage of information junk food. Previously, editors selected the important topics to be put on the first page of their newspaper. But now, those big reports need to compete with all other items posted on social media, including photos of toddlers or lunches. UpWorthy is supposed to be a new way for lifting out important topics, using virality as a tool to achieve this end. How important is the feel-good factor? "But you don’t share classical journalism," Wegner interjects. Pariser agrees that his team would never consider themselves journalists. The service they provide is to find compelling items worth sharing. But not every item is a "feel-good piece". "Some of my favorite items dealt with important issues, like health-care in the US." Similarly, the "wontacular" video was twenty minutes with a child dying from cancer, but told in an engaging, inspiring manner. Especially with important topics, Pariser hints, the story-telling aspect of journalism too often falls short. Recent statistics suggest that the average American spends two minutes on Twitter per month versus seven hours on Facebook. Taking this into consideration, Wegner asks whether we are experiencing a major change in the ecosystem of the Internet, since Facebook currently almost has a monopoly to drive and direct people's attention. Pariser agrees that there is a fundamental change, but one journalists can also learn from. Seeing what people click on can motivate us to "up our game" so that users are more satisfied. As editor-in-chief of the traditional news outlet ZEIT-ONLINE Wegner asks Pariser whether he would have any tips for publications such as Die Zeit. Pariser again stresses learning from observation. "Rather than asking how to dumb down a topic, I would suggest looking at the deep reporting stories that were successful and expanding what they did right into other areas."